Have you booked your place yet? 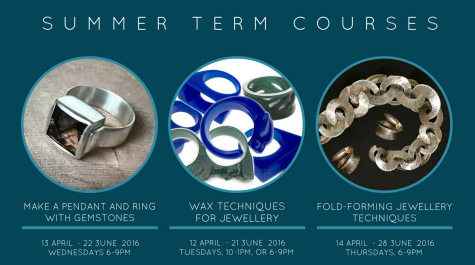 Our new jewellery courses for April are ready and waiting! Join us for a new term at Flux. Our next jewellery courses start from 12 April and we have some great plans to help improve your skills and add new techniques to your repertoire. Beginners G20 – Wednesday eves 6-9pm If you like gemstones in your silver jewellery then this course is for you! We’ll teach you all the core jewellery making techniques for you to design and make a ring with a gemstone of your choice. You’ll also design and make your own silver pendant with a stone. Intermediate C24 – Thursday eves 6-9pm Make fantastic organic forms in silver using fold forming techniques – a method pioneered by Charles Lewton-Brain. Enter his annual competition; see if you can create something that will amaze him! Advanced A24 Tuesday mornings 10-1 or B24 Tuesday eves 6-9pm This term it’s all about wax! learn how to carve and manipulate this modelling material to create both one-off and repeatable forms for the lost-wax casting process. Plan and carve for adding stones, understand the differences between hot and cold wax working techniques. Book your place online now. We’re looking forward to seeing you soon! Tagged 10 Week Term, Alex Yule, Barbora Rybarova, Classes, Courses, Daytime, Evenings, forming, hot courses, Jewellery, Rebecca Dockree, Rings, Techniques, Vicky Forrester. Bookmark the permalink. Vicky is a fantastic teacher, who successfully manages the balance between class demonstrations & instruction with individual direction and advice, whether it be practical issues, design frustrations or just the need for some good old fashioned encouragement. Vicky is passionate about what she does and gets real satisfaction from seeing her students progress and develop.